Texas artist Judy Jensen on Monday handed over the final collection of eight sacred reverse paintings on glass that she has reproduced for Wat Chong Klang, a Buddhist temple in Mae Hong Son Province, northern Thailand, to replace a number of the historic works that were damaged in an earthquake. The eight paintings were presented to Phra Khru Jitta Thana Thammo, the abbot of the 19th century temple, and represent the the third and last group of reproductions by Jensen as part of a project she began in 2013. 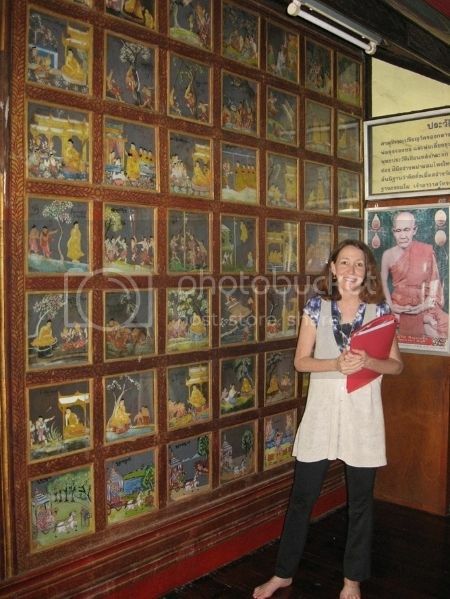 She had earlier recreated 25 of the wooden-framed reverse glass paintings, which were among 180 pieces housed at the temple depicting tales of the Buddha’s life and his Vessantara and Siddhartha incarnations. The images were originally brought from the city of Mawlamyine in neighboring Myanmar in 1867, the same year in which the temple was constructed. Inscriptions on the paintings describe the original painters as ethnically Shan residents of Mandalay. Reverse painting on glass, known as verre églomisé in French and Hinterglasmalerei in German, is an artistic technique that involves painting an image, in reverse, onto the back of a piece of glass. The final image is viewed by turning the panel over and looking through the glass. The technique was widely used in the Middle Ages in Europe for sacral paintings. In 2011, Jensen returned to the temple once again to re-examine the damage and offer her expertise as an artist to replace the damaged works free of charge. In 2013, she received a grant for the undertaking from the James H. W. Thompson Foundation in Bangkok, and in 2014 was designated creative ambassador to Thailand by the City of Austin. Jensen has given talks on the intiative at Bangkok’s National Museum and The Crow Collection of Asian Art in Dallas. Jensen is scheduled to give a presentation on her involvement in the project on 12 November at The Siam Society in Bangkok, where she will discuss the generosity and remarkable coincidences she experienced that enabled the undertaking, and the physical, spiritual, and artistic challenges she encountered. Judy Jensen’s work is mainly focused on reverse painting on glass, frequently in a mixed-media context. She has exhibited widely, including eight shows with New York’s Heller Gallery, the Galveston Arts Center, and the Houston Center for Contemporary Crafts. Group exhibitions include the Gerald Peters Gallery in New York, the Smithsonian American Art Museum, Atlanta’s High Museum, the New Delhi Biennale, Chicago’s Navy Pier, The Detroit Institute of Arts, and The Hokkaido Museum of Modern Art in Japan.